One of my goals for 2017 is to offer machine embroidery education events – in real life. We had our first Embrilliance seminar in Shreveport this weekend and it was a huge success on so many levels. We had two groups of 30 people and classes were taught by myself and Dawn Chace of Creative Appliques. I taught hands on Embrilliance software classes – to 30 people – each class was repeated so everyone got to take all the classes. I love that class model as there is no whining “I wanted to take that class but didn’t get in”. If someone doesn’t want to take a particular class, its their choice to hang out by the pool or in the lounge. Between Dawn and myself – we had so much information to share and we both really LOVE machine embroidery – no one was skipping class 🙂 But we had 60 people at our first event! The biggest success for me was that I survived teaching 30 people hands on computer software classes for 4 sessions! Mac and Windows computers. All levels of computer and software experience. To say I was nervous is an understatement – I had had 20 in a hands on class of just windows computers before. All teachers want their students to enjoy what they are learning and be in a stress free environment. Because so many of the class had done their assigned “pre-class homework” – we took away the apprehension of working in a unknown program. Many people had just been using Express which helped as well – if you use Express you know where the Lettering tool is! We were rocking the lettering tool! OH MY GOODNESS – the first class was in Embrilliance Essentials and we spent a bit of time LOOKING at our design – we zoomed, used the compass rose to move around with our zoom focus, ran the sew simulator, measured stuff, and turned off 3D to REALLY check out the foundation of designs. We resized and saw how easy it is to do in Essentials and again talked about underlay and what to look for in a design if you want to enlarge or shrink it. And then we got to playing with the lettering tool – who knew that you could create such customized designs just by using the lettering tool! As a companion topic to go along with one of Dawn’s classes, we played with her duck applique design. The big thing was creating the cut files from the applique, but we also learned how to use the fabric simulation as a double check for our layering and added color stops so our duck could really make a big splash 🙂 Our customized duck may not have matched the design that they got to watch stitch out in Dawn’s class – oops! But, they got all the software how to from my class and the process was solidified into memory by watching all the hooping, stabilizing, cutting, trimming, pressing, and stitching in Dawn’s class. It all goes hands in hand. 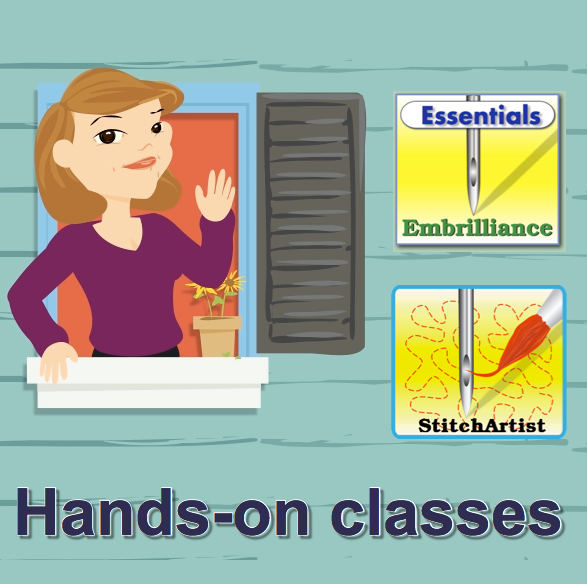 The second hands on class was on StitchArtist – we were going to learn how to digitize. You could feel the tension creep into the class room. Those of us that have been in the home embroidery industry awhile have the stories of our first designs. How long they took to create. How many test sews and tweaks that we had to do to get the design to be passable. Those that had never digitized weren’t sure what to expect – some knew how to use vinyl cutting software and well they got the story from me on how vinyl cutting and digitizing may look similar from 10 miles away, but in reality they had little in common. Vinyl was like bouncing one tennis ball against the wall. Digitizing was like trying to bounce 6 tennis balls at one time – so many things affect each other and you have to have a nice balance or else you end up with a chaotic mess. And we were digitizing fun stuff. We talked about the plan for digitizing. The key point when you have a plan for your project – you’re no longer overwhelmed by the big picture. You have lots of little steps that are easy to tackle and complete and move on to the next. No one becomes a master digitizer in a day, a week or a month. The master of any skilled art will tell you that they are learning and perfecting their skills every day. This blog post was supposed to just be an announcement of all of the events we are hosting but I started writing it before this weekend and well, we see how that went 🙂 Like I told everyone in class – you can find hours of youtube videos and blog posts and forum posts that go over every single thing that I talked about and explained about all of the software programs. But I understand that when you get to participate in an educational in person experience, wonderful things happen. Lights go off! Your neighbor says something about a shortcut that they use and boom! that’s one more thing you learned! There are no dumb questions although you may side track the teacher into showing you something wicked cool that wasn’t planned but everyone loves when that happens. So, I can’t be everywhere but Gayle & I are trying to find unique locations around the country that we can travel to and host these events with a guest instructor who teaches complimentary topics. I hope that Dawn will be able to do another with us in the future – she’s off to Italy for the next couple years — hmm maybe we can crash at her place 🙂 Our other events have other teachers joining me- they will all be fun and we will learn HEAPS! I am setting up information pages on my website under the education menu for each of these events. To find out details or ask questions, we have a form that you can fill out and Gayle will get you the info that you need. If you are not ready to book because your have questions about the above event - what are they? Each event has a complete information page - if you are ready to book, let us know! I would like to be notified when an Embrilliance event will be available in the following locations. Our goal is to find locations that are accessible to a large audience in each time zone. We also have a Facebook group just about the classes and events that we are hosting. Now, in addition to our sponsored/hosted events, we are participating in a couple of trade shows that are devoted to machine embroidery. The Applique Getaway being held at the end of June in Grapevine TX and the Everything Embroidery Market in Chattanooga TN in mid October. This is where we will have the Embrilliance booth in the trade show vendor hall and I am also scheduled to teach lecture classes DURING the event. Both of these are FANTASTIC top notch trade show events that cater to the home embroider-er – the hobbyist as well as those that run small businesses with their machines. Since I’m already going to be there for the events, I have made arrangements with both of these show organizers to teach pre-show hands on Embrilliance software classes SIMILAR to those taught this past weekend! Classes for the Everything Embroidery Market have not yet been announced but registration should start in a few weeks! Sign up for their newsletter to get notified. Registration has already started for the Applique Getaway and I have just posted links to register for my pre-show hands on classes here on my website. Please note that these are COMPLETELY SEPARATE from the Applique Getaway event. Yes, you can register for my classes and not go to the event – you’ll miss HEAPS of fun and all the classes and social events that go on during that event…. but its separate – you could choose not to go. 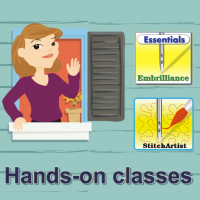 I have broken out the two classes separate and there is a break in between for a late lunch/early dinner – so if you only want the StitchArtist class you can sign up just for that one. You can sign up for both. If you have taken the classes in Shreveport – they are the same. Granted I don’t think I have ever taught the same class exactly the same, but I don’t want anyone saying “how come we did the same things in Shreveport?” I want everyone to have a POSITIVE experience! I tried to answer all the questions on the class information pages. Please read through all the information carefully. The class dates and times are listed on each page – Essentials is first, then a break then StitchArtist. I hope that this all makes sense and that nothing is crashing or doing bad things. You will get payment confirmation from Paypal and within 24 hours I will send an email confirming as well. Enjoy and may your bobbins be full!